Big, Beautiful (Dangerous?) Trees... But What Happens When They Fall? TIMBER! Ahhhh TREES. People LOVE trees, right? They celebrate trees, fight to save trees, hang swings from them, climb them, even build homes in them. But what about the times they are a nuisance or even a danger? For example, when they grow substantially crooked, split at the base, hang precariously over your living space, or drop large dead branches every time a breeze blows? It's a serious problem. And one that may not be a clear cut as it may seem. In Maryland, guess who is responsible for the $$$ involved to remove the parts that present a danger when large branches or a tree itself overhangs, encroaches, or worse, falls and causes damage? Hint: It is most often NOT the owner of the property where the tree is actually rooted...! The truth is that your neighbor "may" be responsible when a tree falls over your shared property line ONLY if you can prove they were fully aware that a tree was a hazard and refused to remedy the problem. Practically speaking, your insurance company is most often on the hook for the damage, and typically will fix things first and may later decide whether or not to pursue reimbursement from the neighbor/their insurer establishing negligence to recoup their moolah. But wait -- if it isn't even technically "MY" tree, why is it "MY" potential problem to stop something bad from happening? 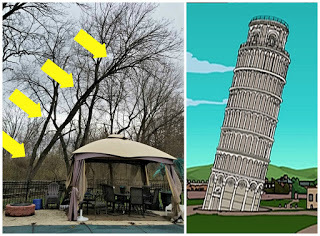 In Maryland, there exists a modified version of what is known as the "Massachusetts Rule" limiting your ability to control and mitigate the situation via what they call "self-help" measures that only allow for you to address the part(s) of the tree that overhang your property. The tricky part is that you can't access that non-owned property without express permission (for example. to climb a tree to get to branches that need to be removed), nor can you prune or cut the tree in such a manner that it "significantly harms" the tree.... ummm.... tricky indeed. Especially if a tree looks like THIS... ??? In the case pictured, which is actually the situation in my own backyard (!!! ), a very large older tree is rooted off property, but over 95% of it is very clearly (and dangerously) leaning over top of my property. It is in poor health, and regularly drops large branches into my yard. Were I to "self-help" on chain saw massacring those encroaching elements of the tree, it would be "substantial" and would absolutely harm the tree. Which in this case, is probably exactly what needs to be done...but I have to run through the proper channels to be sure I don't end up on the wrong end of potential litigation. Description of the problem--Highly suggest consulting with a third party arborist or tree removal company to document the issue and establish "proof" of dangerous condition...and to find out how much it costs. Tree removal is NOT inexpensive! A specific request for action--What do you want done? Are you willing to split costs or similar? Consider the possibility of sending a copy to the HOA or other governing body if applicable--you may want to wait on this element until after you get a response from the neighbor. Working it out between parties is typically the more neighborly way to go whenever possible. In the meantime... Trim what you can. If smaller limbs of a tree hang over your property line, you may try trimming the branches, but be sure to use abundant caution in how much you remove. 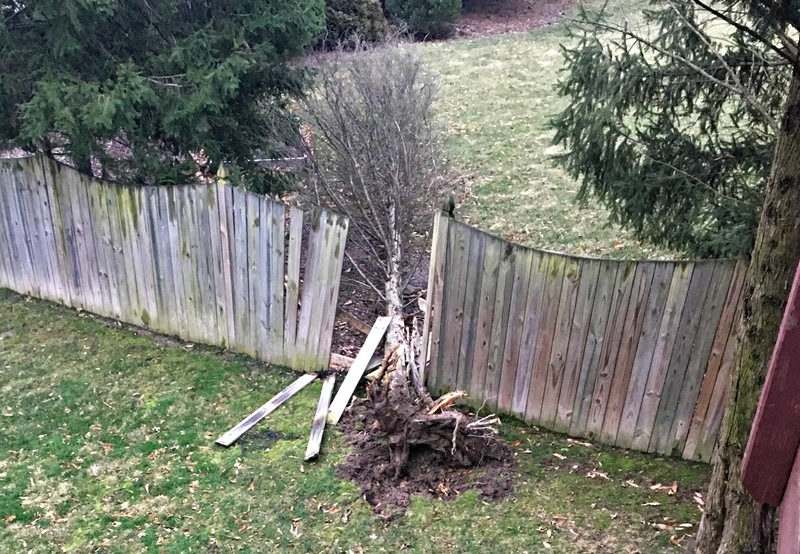 Consulting a professional is always a smart idea--Remember, if a tree dies after your Edward Scissorhands routine, your neighbor can potentially pursue a claim against you in court. Learn about your homeowners insurance policy. Take some time to investigate your individual policy and know how it addresses losses or damage caused in situations like this.Uphold stresses that "every policy and every potential claim scenario is different, and often times there are gray areas in coverage that can be important to understand before you end up in a sticky situation." Who actually owns the property adjacent to yours? If you don't already know, it is probably in your best interest to find out. Does your HOA (if applicable) have any rules governing trees in your neighborhood? You might be surprised to learn that removal or alteration of ANY tree on HOA property requires notice and justification. Are your property lines really where you think they are? Fences are not foolproof indicators of boundaries. A tree you think is your neighbors might even be yours.